Avraham got the "muslem" world to believe in G-d...also the Jerusalem and Gush Etsion neighborhoods. Isaac spread the spiritual wealth to the plains and got Abimelech to repent. Jacob had 17 "good" years with Josef in Hebron and 17 "good" years with Josef in Egypt. Why the bad years? 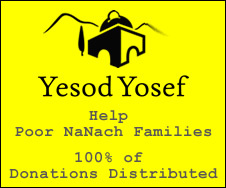 Without Josef, (yosef li odd ben echad) there was NO HAFATSA. When Jacob dies the Egyptians mourned 70 instead of 40 days this is to symbolize that the whole world was influenced by Josef and Jacob (HAFATSA). Why were the "holy tribes" not chosen to replace the Egptian priests? The brothers were not telling the truth to their father, (neither were the Egyptians but nobody expected that from them anywayse). Dan is blessed that he will be a tribe of Israel...duh what is he according to you? Epraim and Menashe who are these?? (the midrash says, not the halacha) They are the prefered SONS of Jacob! Did Josef say "no they are not so bad, they have good points too?" Is Menashe not known as the greatest "baal tchouva", more desirable an event then the coming of Moshiah (according to Rabbi Nachman). These were MORE sons given to RACHEL by Josef (future converted nations). Please open your minds...by being be "simcha" not only will you "love" one another, but you will do Hafatsa and without eating skulls, you will become brighter! Rabbenu warns against too much chochma...he isn't talking about fearlessly going out to understand, he is talking about fearfully limiting yourself to the status quo. The Halacha we do not move away from, but no one understands the Tora and Rashi is only "a brother" so please don't cut yourself off from life.